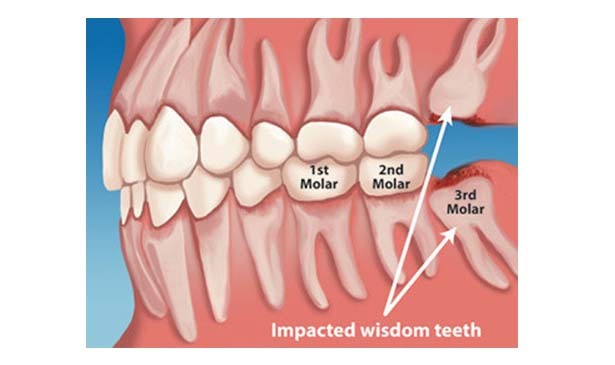 Home Health & Wellness Tooth Talk What is a Wisdom Tooth? Your wisdom teeth are nothing more than the third molars found on both the upper and lower jaws. They grow in all the way at the back of your mouth and they look like your other molars. Some people don’t experience a single problem with their wisdom teeth, but in others, they can cause pain, infection, and discomfort. They usually appear between the ages of 17 and 21. How many emerge differs with the individual. In some, the wisdom teeth may only partially erupt, or even stay buried within the gum tissue. Teeth that don’t appear and remain covered by tissue or bone are called impacted. • Typically include pain and discomfort. • Infections, gum disease, and tooth decay. • Difficulty with brushing so far back in the mouth. • May grow in malaligned causing crowding of your teeth. Problems with wisdom teeth usually end up with them being extracted. Dentist often prefer to remove the wisdom teeth when patients are in their late teens or early 20’s. At this age they are easier to remove than in older adults. Wisdom teeth have nothing to do with growing wiser, only growing older. If your wisdom teeth give you pain or discomfort, see your dentist to reduce your risk of problems later.